MK1 125LC. If you have a pic of a missing colour then please do feel free to mail it to me. I cant do this site with out your help, and it is very much appreciated CHEERS.In the summer of 1982 the RD 125LC was unleashed on the UK learner market. 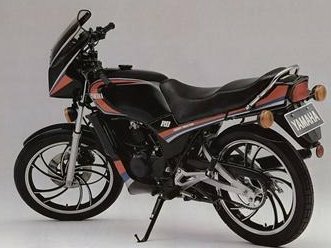 It was the successor to the Air coold RD125 twin. They put a sporty bikini faring and bellypan on it as standard. Even though this 125 was restricted to 12 bhp and 75 mph with a micron or allspeed (the pipes of choice at that time) it could see just over 100mph on the clock down a good hill. With a cantilever mono-shock swining arm italic style wheels It addopted from its big brother the 250lc and a single cylinder water coold engine it realy did look the biz. They just flew out the dealers shops. MK2 125LC. In 1985 yam updated the 125LC with the MK2. Theys had rounded clocks replacing the dated rectangular ones of the MK1. It had better thiker forks, clipons with bare ends. Gone where the famous itilic wheels swoped for straight spokes, puting 16 inch front wheel on it with and a braced front mud guard and a diferent disk and an aposed piston brake caliper, this improved the stability and handeling and braking. The wheels looking very simuler to the 350YPVS now on the market. At this time there were quite a few 125's chomping at the lc crown the RG, NS, MBX, MTX , KMX, AR and yams own DT all sharing the sales. Colours: Mk1 White with red decals, White with blue decals, Candy blue with grey decals and in 1984 Red with white decals. Colours: Mk3 White with blue decals. Plus the 2 above.